Traverse Bay Inn’s road sign, on US-31 coming into town, is unmistakable. The word “Fun”, crafted in big, bright letters, catches your eye. It seems like a promise of things to come, and in all likelihood, it is. Located on Traverse City’s “Miracle Mile”, Traverse Bay Inn is centrally located to all the recreational options the area offers. The region’s best beaches are just minutes away, as are a plethora of other activities and attractions, including wineries, golf, downtown shopping and dining, not to mention a host of water sports. It’s a small wonder, then, that Traverse Bay Inn attracts such a wide variety of guests. 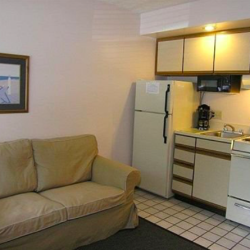 Every unit at Traverse Bay Inn features a complete kitchenette—pots, pans, dishes, etc.—so guests don’t have to eat out all the time. The two-bedroom suites, with a king bed upstairs and a queen bed downstairs, offer families the option of togetherness or personal space. Some units come with a hot tub, while others have a fireplace, so you can pick your preferred method of warmth and relaxation. Traverse Bay Inn also has a large, outdoor pool —a convenient alternative to going to the beach everyday. Add to these, a friendly, helpful staff and attractive seasonal specials, and you have a lodging experience that’s both “fun” and “fitting”.